Hello! Thank you for your lovely comments on my last post regarding the fabric shop. It's going ok, a little slower than we'd like, but it's such early days. I think we just need to get the word out there a bit more so people know we're here! It's a sweet little village were situated in, but not the busiest, so we cant really rely on passing trade alone. The Etsy shop is looking much fuller now. We've been adding new fabric listings all week. There's still lots to go though, including all the lovely new things still coming in! 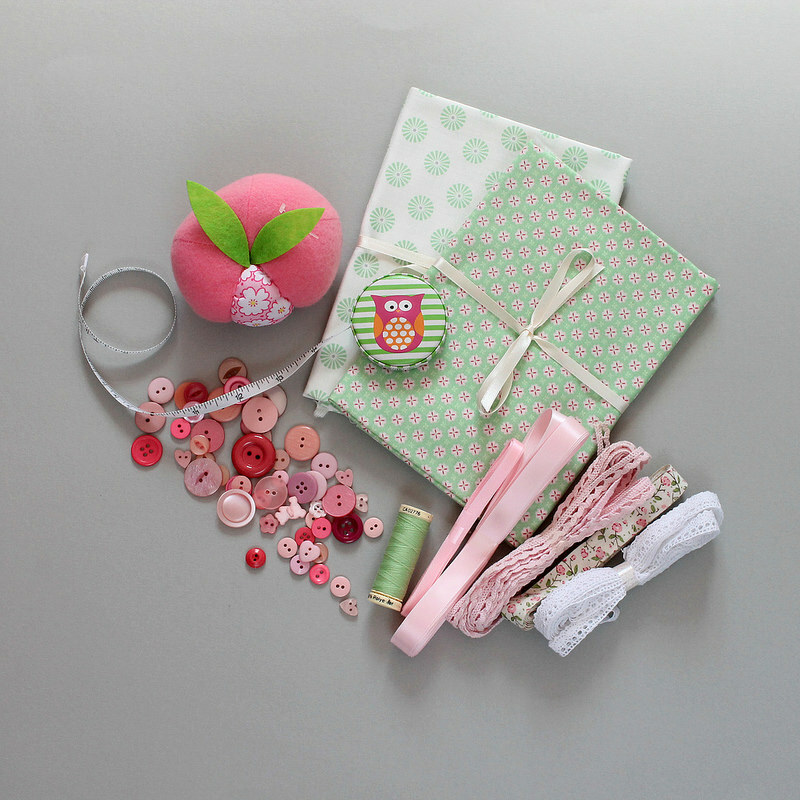 I have a few bits and bobs from the shop to giveaway, including these pretty Gutermann fat quarters, an owl tape measure, pin cushion and ribbons, buttons and cotton. Congratulations and best wishes with your business enterprise. You've chosen such sweet colors for your bundle giveaway! They make me smile and I'd love to make something fabulous with it all! I love these adorable patterns and colors in your giveaway. It can all work together in some way. Thanks for this amazing giveaway. Do I see some heart shape buttons there? Totally adorable! Good luck with your new business! Love it!!!! Good luck with the business! Love the fabric ! Thank you for such a sweet giveaway. So sweet I am cutting out owls right now to make a quilt. what an exciting venture! I can tell by this bundle that I would love your shop. thanks for the chance to win! Lovely fabric and goodies! Good luck with your shop! I love the owl and the cute fabric! Great store! Beautiful fabric and darn it woman your Instagram is outstanding, definitely something to be admired! Those fabrics are ever so lovely and you've got some gorgeous ones in your shop too! Good luck with your new business. I love the owl tape measure. Loooove these Treasures!! Owl is sooo cute too! Thanks for chance to win your give-a-way! Congratulations on your new venture! And thanks for the beautifully curated giveaway. What lovely things! I love the sweet combination of fabric, trim and buttons. I am also a collector of pin cushions. This one is a cutie! Congratulations. I love all the little buttons. What a sweet bundle. Thank you for the great opportunity! Thanks for the nice giveaway and good luck with your fabric shop! That tape measure is the cutest I've ever seen! Thanks for the chance to win! Wishing you the best in the new endeavor! Congrats and wish you well on your adventure! I'll be following you for sure! I love the bundle of goidies you've put together. I'll keep my eye on your etsy shop! Love the goodies - especially the buttons! I make bookbags to go with my books when I sell them at signings--and this little packet you've put together would make a LOVELY bookbag! I haven't used lace on the bookbags, but just seeing these things in one place has provided a bunch of ideas! Congratulations... And what a gorgeous bundle, fingers crossed. I love pretty colors in your giveaway items. Thanks so much for the chance to win them. And congratulations and best wishes on your new venture. pink and mint, what better colors! I just looked at your Etsy shop - the photos are lovely! Stick with it! What a lovely giveaway - thanks for the chance to win. This is a wonderful prize pack. Good luck with your business. You have some lovely fabrics for sale.